Today is Mother’s Day and I’m feeling grateful to have my babies home (one back from freshman year at College for the summer and the other spending the summer at home before venturing out to College in the fall). I will be an empty-nester soon… soon, but not today! Today, the house smells wonderful – of eggs from the chickens in my garden, fried in olive oil. Cooked for us by my daughter. I remember a Mother’s Day when the kids were much younger when my husband asked me what I wanted. I asked for the day off. He took the kids to a museum so that I could bake a loaf of olive bread from scratch. That’s what I really wanted. I wanted to be left alone. For one day, I didn’t want small messy helping hands around – touching everything – touching me. I didn’t want to learn or teach. I didn’t want to talk. I baked two loaves that day. This week, has been a week of contemplation for me. Since the beginning of this year, I have felt the urge to do something with my life. I’ve had that feeling all my life (except when I committed to mothering)… If I think rationally, and take inventory, I know that I’ve done a lot with my life. But lately there’s a real, primal, unsettling urgency to do something more… I can’t explain it. Maybe it’s just the anticipation of the coming change. Maybe, it’s the need for change. I don’t know. I just feel like time is speeding too fast and running out. Of course it isn’t. Time is time. It is not linear and it does not run out. I know this. And yes, I also know that this lifetime is finite, but that’s not what I’m talking about. At least I don’t believe that’s what it is. There’s an urgency about something that is difficult for me to pinpoint. The urgency feels real. The sensation is stopping me from functioning and putting one foot in front of the other while tolerating the status quo. And so of course I am pushing through – putting one foot in front of the other anyway – doing more – despite all instincts – and people are commenting about how “different” I am. They prefer the old me; gentle, peaceful, spacious and giving. Lately, I have been moving too fast, giving too much and demanding more as if that would somehow slow things down. In anticipating the change, I’ve become the change, resisting, and being resisted. This isn’t new for me. I’ve been on this edge before. This tension is familiar to me. And, before, when I thought it was the end, it turned out to be just another beginning. I remember the first time I showed up to the edge but refused to jump, I was pushed and I learned to fly. Who would have imagined that more can be achieved by doing nothing – resisting nothing – dissolving into the moment presenting itself? The most recent time I was at this edge, I didn’t jump off. I did the opposite. I collapsed inwards. I stopped, stood still and curled in towards my center, my silence, the earth, and nature… And, the quieter I became, the more ready I was for life. And, when I emerged, everything was right with the world and I carried on. Is it time to be quiet again or it is time to talk? I shivered when I read that. Yes. That’s what it takes. Our need for peace must be greater than our thoughts of revenge. And, now I know that I’m not alone. I watched the movie earlier this week and it gave me hope. I know we can have peace in my lifetime. All we have to do is choose to have peace in my lifetime. I have personally already made this choice. It seems appropriate that on Mother’s day, I find myself contemplating peace. 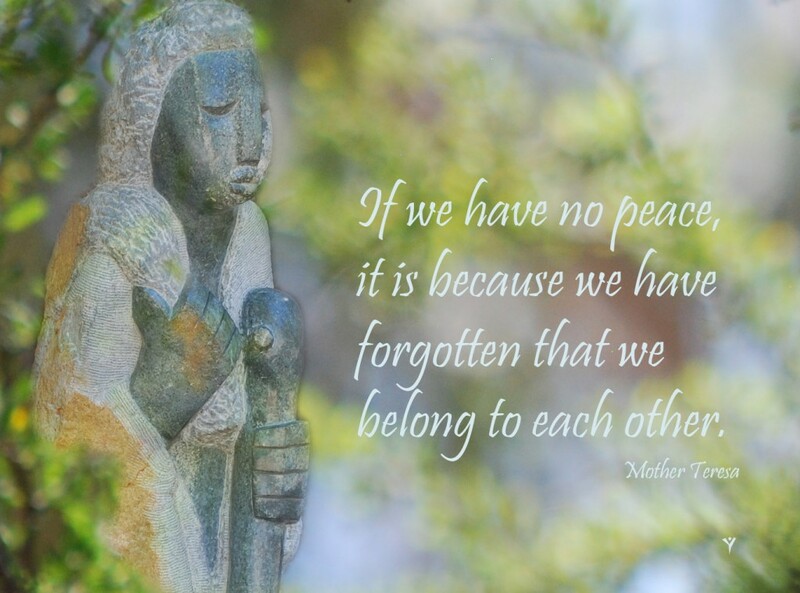 In the Huffington Post, there’s an article from Matthew Albracht entitled ’From the Bosom of the Devastated Earth,’ a History of Mother’s Day for Peace. This morning started with my daughter handing me a printout about the life of Julia Ward Howe and in the spirit of honoring her, she had hand made something for me – a painting that I’m not allowed to share with anyone. She’s in the midst of studying for her finals but she took the time to paint something for me. She too must be feeling the fast approaching milestone. I’m a mom. I can tell. Perhaps, like me, she too feels the need to leave something of herself behind. Makes me wonder where is this taking us and inspires me to continue to try and dream the future that my heart desires. I will not be discouraged (at least that’s what I have to tell myself). How can I engage in conversations with everyone? I don’t like the split between the 99% and the 1%. Is it possible to have us be 100%? humans? What am I doing that keeps the 1% there? I am responsible. I’m sorry. Please forgive me. And, I love you. I want this practice to bring me peace and it doesn’t. Right now all I can do is be a witness. Aware. I am responsible. The reality is not what we think it is. What are your thoughts? What are your feelings?